Bonding over childhood memories of Victorian carousels and fairs, London-based designers Suree Wan and Jan Kae launched their jewellery label Hop, Skip & Flutter in 2011. 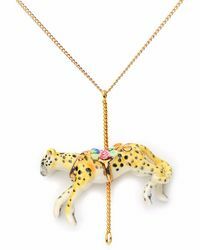 Taking inspiration from fairy tales, nature and whimsical merry-go-round characters, the vintage-inspired porcelain collections of Hop, Skip & Flutter necklaces, rings and earrings are all hand painted and finished with Swarovski crystals. Make a quirky statement with Hop, Skip & Flutter necklaces, featuring animal portrait pendants and merry-go-round characters.